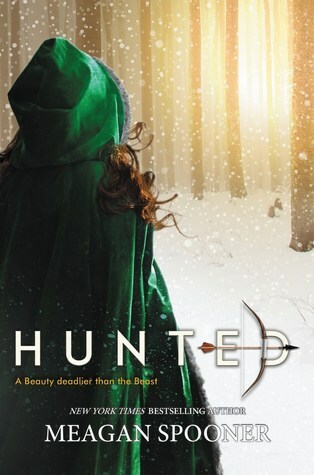 Ever since I heard that Meagan Spooner was writing a retelling of my favorite fairy tale, Hunted has been one of my most anticipated reads of 2017! I loved her Starbound Trilogy and knew I would probably adore anything she wrote. Yes, it was incredibly hyped, but how could a Beauty and the Beast retelling not be amazing? As it turns out, Hunted is a pretty straightforward Beauty and the Beast retelling with a few embellishments to the characters' stories. Yeva is literally called Beauty and the beast is literally called The Beast. He lives in a castle in an enchanted valley in a forest and Yeva stumbles upon it while looking for her father. She is taken prisoner and slowly realizes that there's more to Beast than she first realized. It's almost cut and paste, which I have absolutely no problem with because I love this story! Although this book is extremely predictable if you are at all familiar with this fairytale, Meagan Spooner has taken it and tweaked it just enough to keep it interesting. I thought that both Yeva and Beast were incredibly interesting characters! I was invested in them and would honestly have loved a little more backstory to Beast. Now that I've talked about what I enjoyed, let me jump right into my complaints. Hunted is a book in desperate need of a villain. Not only has the villain been removed from the story, but the urgency has too. Without a time limit on the beast's curse, there's not really anything at stake and the book is incredibly slow as a result. Not even Yeva was in any kind of hurry to break the spell and I was bored to tears. It took me WEEKS to get through Hunted, which is incredibly abnormal. The writing also becomes more flowery as the end approaches, making it even more difficult to slog through an already boring story. The world building was also severely lacking. Beast's valley is enchanted, can only be found if he wants you to find it, and there's a castle at the center. Yeva lives in a village and then in a cabin in the woods. That is the extent of the world building. Someone just informed me that this book was set in Russia and I had absolutely no idea! After the incredible world building in the Starbound Trilogy, I expected way more. Yeva listened in silence, her own thoughts troubled. She'd known other women who'd formed attachments to men who were cruel to them, though she'd never known any in such dire situations. She'd always thought them foolish, weak, lacking in the self-assurance to know they were better than the men whose backhanded compliments made them flush so. But perhaps they were simply in love. Perhaps their hearts had betrayed them, and not their courage. This conversation goes on between Yeva's friend who is voicing her concerns about Yeva's time with the beast, and Yeva who tries to justify his treatment of her with internal dialogue like that quoted above. I mean... I don't know. I'll just let you judge that for yourself. Hunted had the potential to be incredible - just look at the source material - but it fell way short for me. With the removal of all urgency the story dragged on forever and the romance creeped me out. I also found the ending to be pretty anti-climactic. The only thing I liked about this book was the characters and the parts that were pasted directly from the original. Sadly, this just wasn't for me.